Measuring up at 191 square miles in terms of its surface area, Lake Tahoe is one of the biggest lakes in all of North America and one of the most popular natural tourist attractions. With countless visitors coming to see the lake from all over the world, hiking, camping, and other outdoor activities are regularly enjoyed all year long in the area. Kayaking at Lake Tahoe is also extremely popular, with the entire body of water being navigable. Various companies have started up in the Lake Tahoe area over the years offering kayak rentals, kayak lessons, and guided kayak tours, providing a whole host of options for anyone interested in trying out some kayaking fun on one of America's most beautiful bodies of water. 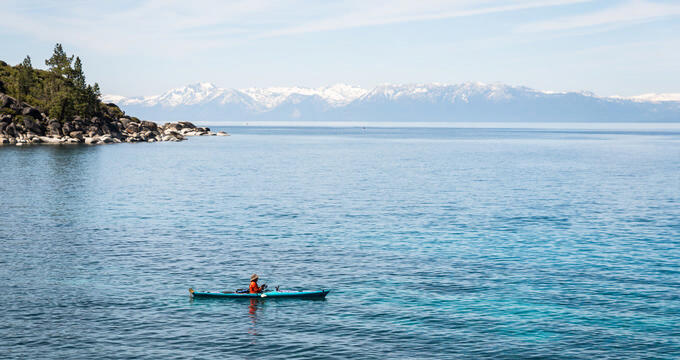 With over 70 miles of shoreline to navigate, kayaking at Lake Tahoe is an incredible adventure and there's more than enough space for everyone, allowing individuals and groups to enjoy their own little patch of lake without ever feeling crowded out. Kayaking at Lake Tahoe can be a lot of fun for people of all ages, but there's some important information that all visitors need to be aware of before setting up. The lake is enormous and its water is exceptionally cold, even on hot summer days. This is why it's vital to try and keep your kayak upright at all times, as many cases of cold water shock and hypothermia are reported each and every year. It’s also smart to not stray too far from the shoreline just in case any accidents do occur. Life jackets should always be worn and children require constant supervision to ensure that every Lake Tahoe kayaking adventure goes smoothly and happily for everyone concerned. Even experienced kayakers can fall victim to the lake's frosty waters, so it's highly important to be smart and safe every time you head out there. This is also why it can be so vital for newbies to sign up for some kayaking lessons and classes with any of the various kayaking companies operating around Lake Tahoe. Kayaking companies like Tahoe City Kayak, Kayak Tahoe, and Tahoe Adventure Company are all highly rated and offer a bunch of different kayaking services including guided tours, classes, and rentals. With so many different kayaking opportunities to choose from, visitors to Lake Tahoe won't have enough time to try everything in one trip, so you'll have plenty of reasons to come back again and again in the future. Tours run at all times of day and night, including full moon evening tours, sunset tours, and special 4th of July fireworks tours! The difficulty of these kayaking tours can range from easy to moderate and all the way up to more advanced routes, suitable for a wide range of ability and experience levels. Taking in the various shorelines and features of Lake Tahoe, these kayaking tours are run by trained guides who lead the way and keep everyone safe, while also answering any questions you might have and providing fascinating information about the history of the lake and local area. One of the prettiest areas of Lake Tahoe to enjoy by kayak is the East Shore. Tahoe City Kayak runs a wonderful Sand Harbor kayak tour, starting off at Sand Harbor Beach and running down along the big boulders of the Eastern shore, as well as stopping off for lunch at a hidden beach that many tourists don't even know about. It's a great way to enjoy the lake and just one example of the many super kayaking tours visitors can enjoy in this area. Companies like Tahoe City Kayak and Tahoe Adventure Company also offer lessons for small or large groups, with a variety of skills and techniques being taught by qualified instructors. Whether you're new to kayaking and need to learn the basics or a seasoned pro looking to improve your technique, there's something for everyone here. In addition to the lessons and guided kayaking tours of Lake Tahoe, there's also the simple option of just renting some kayaks and heading out on your own expeditions. Rental stations are available at various areas along the Lake Tahoe shoreline, offering a mixture of different kayak models and styles to suit almost everyone. Guides and maps can also be purchased with route suggestions to help you plan your own personalized kayaking adventure, and renting is a fun way for families or groups of friends to spend time kayaking on Lake Tahoe together without needing to follow a fixed schedule or program.